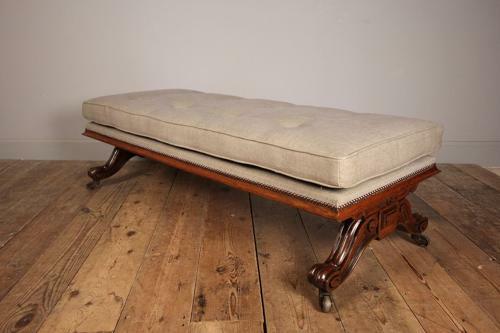 A beautifully proportioned centre stool, having a shallow buttoned swab cushion, raised on an Oak scrolled carved legs with original castors. Super colour and newly upholstered in a fawn linen fabric. English, late 19th century. The stool would make a wonderful alternative to a coffee table with the addition of a tray.